Perugia returns to be the chocolate capital with Eurochocolate, from 19th to 28th October 2018. A unique experience, where chocolate is both proposed as a product and also as an instrument of knowledge of different worlds and cultures. And there is more: this year Eurochocolate will have a great recurrence to celebrate! The well-known manifestation celebrates its 25th edition, a silver wedding then for an edition that will retrace the most significant stages of its history, promising a special program even more rich in events. 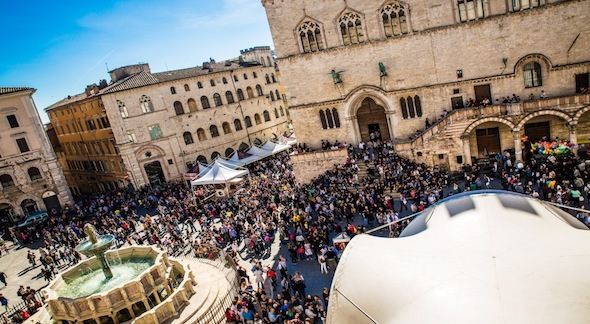 "We will retrace the steps that have made this event famous, also thanks to the participation of some of the protagonists, national and international, of the chocolate world that have passed in these years for Perugia. 25 years of history are an important goal, but certainly we will not be imprisoned by the nostalgia of memories". >> We suggest you many offers for hotels, b&b and farmhouses in Perugia and its surroundings, discover them here! 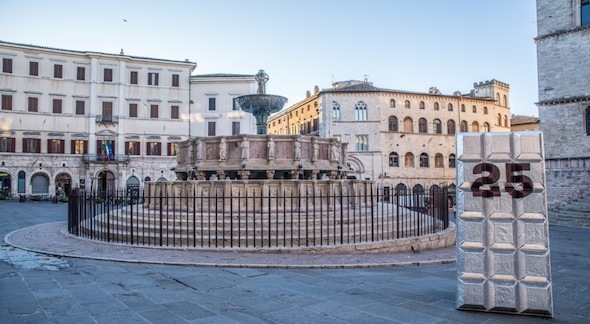 In the main square Piazza IV Novembre, in the heart of Perugia and Eurochocolate, a super chocolate sculpture will always be installed. This year, there will be a Maxi box of chocolates: 24 meters for a box containing 25 assorted chocolates. This sculpture has a precise meaning: Eurochocolate is in fact like a box of chocolates, in which you never know what can happen! The public will have fun taking unique and original selfies to share, while the stage will be animated by fun games that will allow visitors to receive delicious tastings. Also, you will have fun sharing a unique and original selfie. And this is because Eurochocolate is also sharing: a gluttonous feast and, at the same time, an experience to live in company! And it does not end here! If it is true that it is a birthday, a full party can not be missed. Then mark in your agenda the 23rd October 2018, the date of a special party: there will be a big chocolate cake and the 25 candles will be turned off to celebrate Eurochocolate. Speaking of silver wedding, moreover, particular attention will be dedicated to couples who are also celebrating 25 years together: they are invited to write to the organization to the email correvalanno@eurochocolate.com. Not to mention the couples celebrating the 50 year milestone: the event will also be dedicated to them, with a special greeting to those present. One of the most awaited events is the revival of Cioccolatomania, a success from the first editions of Eurochocolate, well impressed in the memory of the fans. This is a special guided tasting course, which will be repeated through testimonies of the protagonists of that time, often young talents who have become real national and international protagonists. Another of the most beloved events of the Eurochocolate editions that will be repeated now is Sweet Moments: these are secret events that will take place throughout the event in a spontaneous and unpredictable way. To announce them, a simple message on the social platforms of Eurochocolate, which will be released shortly before the performance of these surprise artistic guests! To have a memory of each special edition, guests are enchanted by a new line of chocolate products, inspired by the annual theme of the festival and made by Costruttori di Dolcezze of Eurochocolate. Last year we had music theme: there were chocolate cassette tapes, vinyls, CDs, radios and piano keyboards of white and dark chocolate. We are still waiting about the 2018 new line! All the old city center will turn into a real paradise for gourmands: an open-air general store of chocolate, with thousands of products and more than a hundred companies of the national and international confectionery sector! 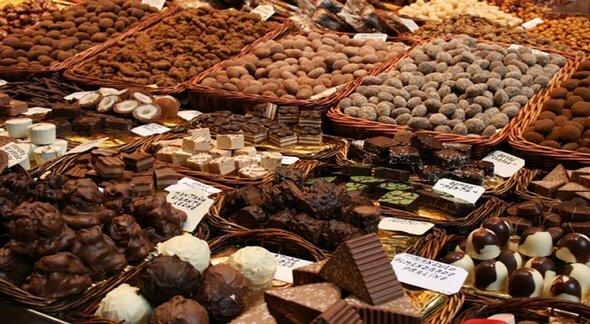 The best chocolate companies, both artisanal and industrial, will be present at the festival with their stand through the streets of the center of Perugia. - the exhibition spaces of the artisan chocolate makers ... and much more! There will be then the classical appointments as the famous Chocolate Statues, scheduled on Sunday 15th October in Corso Vannucci, Piazza IV Novembre and Piazza Matteotti. Are you ready to become a real chocolate expert? You will walk through the stands and discover the most good and special products made by chocolate, and of course with Eurochocolate you will take part in guided tastings, workshops and meetings, to learn all the features and the secrets of chocolate and its world. Joining is free and easy, you only have to subscribe to one or more of the appointments! The calendar will be available in October, so follow us to stay up to date! 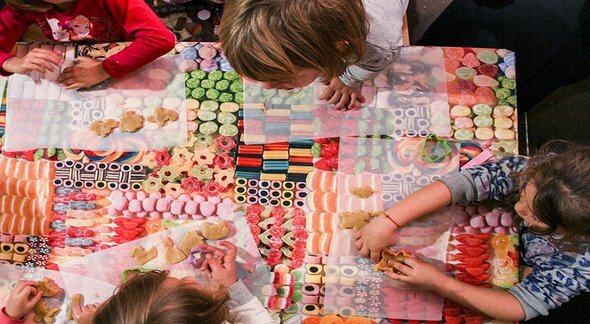 Without forgetting the kids: every afternoon and on the weekend there will be many educational meetings about cocoa and chocolate, expecially dedicated to the children, to learn while having fun and enjoying sweet tasting! Handling and cake design, preparation of biscuits, discovery of the production of fair chocolate ... the definition of programs is in progress. The laboratories are free and open to all children, it is not necessary to reserve. >> Join the love of chocolate to the love of nature and stay in a farmhouse in the coutryside around Perugia !